Inspired by the Nature House in Sweden, the Hjertefølgers wanted a large glass dome to cover an entire home and garden on their 7000m² remote island site near Bodo, in the Arctic Circle. Their vision was to create a sustainable eco home and way of life for their family that would be beautiful, ecological and healthy. The Hjertefølgers, aware of the robust properties of a geodesic dome, wanted a dome to provide a strong glass cover to their home. 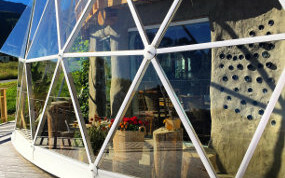 So, as an established glass geodesic dome company, they approached Solardome Industries. 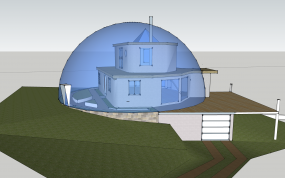 Solardome have long been an advocate of sustainability in its products and practices and so took on the challenge to make this environmental eco home a reality. To help create a self-sustainable way of life, the dome also needed to act as a greenhouse to allow the Hjertefølgers to grow an abundance of plants and produce that would not normally survive in the extreme Northern European climate. 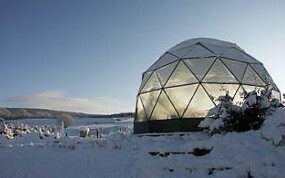 The Hjertefølgers’ project used our SOLARDOME® PRO system. This scalable system, which is optimised for custom geodesic dome designs between 8m and 25m in diameter, was ideal for the Nature House. It is an incredibly strong and robust design that can withstand the extreme snow loadings buildings can be subjected to in the Arctic Circle. A 15m diameter dome was sufficiently large enough to cover the house and garden which comprised of a 200m² three-storey house, an 80m² garden, and a further 100m² rooftop garden. It took just three weeks for the 15m diameter, 7.5m tall dome to be built, after which construction of the eco-home began under the cover and protection of the glass dome. 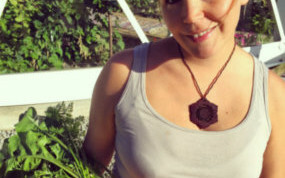 Geodesic domes are amazingly strong structures and have a comparatively low amount of materials. This in turn means that deep foundations were not necessary, and therefore have very low impact on the environment. The aluminium frame used has a structural lifespan of over 100 years and doesn’t require regular maintenance. This dome contains 360 glass panels and a total length of 832m of recycled aluminium for the frame. The spherical design of a dome means it requires 30% less building materials than conventional rectangular structures enclosing the same space. Their dome home includes a set of double doors, 11 windows, five of which are digitally controlled, and a large door aperture to allow access to an outdoor decking area. This innovative build has brought the community together as friends, family, and volunteers from the local area have all been involved in its creation. The Hjertefølger family is now living in their Nature House. Their lifetime dream of creating a sustainable, self-contained environment has become a reality. 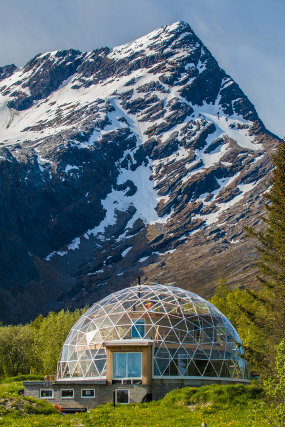 The challenge To provide a glass dome to cover a house and partial garden and be able to withstand the extreme wind and snow loading conditions in the Arctic Circle. When considering a greenhouse, Dr. Adrian Napper knew that the strength and durability of the geodesic dome shape would be the only structure to stand up to the harshest weather conditions.